Is levothyroxine therapy enough for all hypothyroid patients? The thyroid gland produces two iodine-containing hormones, T4 and T3, but much more T4 is produced than T3 on a daily basis. T4 is considered poorly active, even inactive by some, whereas T3 has the most activity due to its ability to concentrate inside the cells and activate the thyroid hormone receptors. When measured in the blood, T3 levels are remarkably stable throughout the life of a healthy adult, providing a steady thyroidal effect in all tissues. But if T3 is the active hormone, why does the majority of the hormone produced by the thyroid is T4 and not T3? It turns out that in healthy adults about 80-90% of circulating T3 is produced in tissues outside of the thyroid gland through a reaction that uses T4 and produces T3. This reaction is known as deiodination and the enzymes that mediate this reaction are known as deiodinases. Thus the plasma contains a mixture of T3 that was secreted directly from the thyroid gland with T3 that was produced outside of the thyroid gland through deiodination. There are no differences between these two T3 molecules and both can equally elicit “thyroid” effects in all tissues. In patients with hypothyroidism due to chronic autoimmune thyroiditis (Hashimoto’s disease), surgery or other causes, the thyroid gland does not adequately function and its contribution to the circulating T3 is reduced or lost. At first glance, treatment for hypothyroidism seems straightforward, i.e. daily tablets of levothyroxine, the pharmaceutical grade of T4. The rationale for the so called ‘monotherapy’ approach is two-fold: (i) most thyroid hormone secreted by the thyroid gland is T4 and (ii) most circulating T3 is produced outside the thyroid gland. Therefore, a main goal of this therapy is to normalize serum TSH and T4 while deiodinase-mechanisms should be able to normalize serum T3 on their own. In fact, this rationale was used when developing previous guidelines for treatment of patients with hypothyroidism, and most patients responded very well. However, for about 10-15% of patients, this strategy doesn’t resolve all of their symptoms despite the fact that normal serum TSH and T4 values (and supposedly T3) can be achieved. How can this be explained? Well, many of the symptoms of hypothyroidism, e.g. low energy, weight gain, tiredness, are also commonly observed in other conditions, for example women during climaterium, the syndrome of endocrine, somatic, and psychic changes occurring after menopause. In addition, depression is prevalent in the general population and can lead to similar symptoms. Thus, most scholars have assumed that residual symptoms of hypothyroid patients are not necessarily due to failure of the monotherapy with levothyroxine. However, clinical evidence that monotherapy might not normalize the circulating thyroid hormone levels exists. An important question is whether a normal serum T3 is/can be found in patients using levothyroxine monotherapy that have normal serum TSH and T4. In a large study comparing approximately 3,800 normal individuals with 1,800 patients who underwent thyroidectomy and were treated with levothyroxine monotherapy most had a T3 within the normal range, but in about 15% of patients T3 levels were not normalized despite normal serum TSH (Gullo et al, PLoS One, 2011). This number may very well be even higher in light of a study indicating that the commonly used assays to measure serum T3 (immune assays) underestimate the results by about 20% when values are near the lower limit of the normal reference range. Although studies with much smaller number of patients suggest that a normal serum T3 can indeed be achieved under these circumstances, other studies and clinical experience indicate that hypothyroid patients maintained on levothyroxine monotherapy hardly exhibit normal serum T3 levels. Even if one accepts that serum T3 levels are slightly lower in hypothyroid patients maintained on levothyroxine monotherapy, a key question remains, i.e. is such a mild reduction in serum T3 clinically relevant? While it is almost intuitive to answer YES to this question (any reduction in serum T3 should be relevant given that T3 is the biologically active form of thyroid hormone), clinical data supporting this conclusion are not available. Using this rationale but ignoring the lack of clinical supportive data, a number of studies have been performed in which hypothyroid patients were treated with T4 combined with T3 in order to make up for the small amounts of T3 that are produced directly by the thyroid gland daily. Different products containing a combination of T4 and T3 are also commercially available. However, most randomized clinical trials comparing monotherapy versus combined therapy (T4 and T3) failed to reveal strong differences in clinical outcomes. Even when analyzed by meta-analysis no difference was found in the effectiveness of monotherapy versus combined therapy on symptoms such as bodily pain, depression, anxiety, fatigue, quality of life, body weight, and cholesterol although there was patient preference for combined therapy (Grozinsky-Glasberg et al, JCEM 2006). The discovery of this Dio2 polymorphism led to the obvious hypothesis that subgroups of hypothyroid patients may respond differently to monotherapy versus combined therapy depending on their genetic makeup. There are data suggesting that in hypothyroid patients with the polymorphism, symptoms are improved when treated with combination therapy (Panicker et al, JCEM 2009), although larger studies need to be performed. 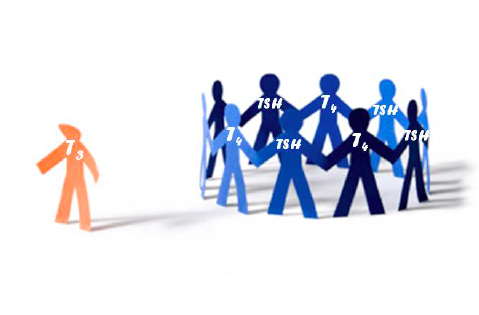 For the vast majority of hypothyroid patients levothyroxine alone is enough to feel well but for some individuals’ symptoms persist despite normalization of serum TSH and T4 levels. A relatively common polymorphism in the type 2 deiodinase gene has been identified and although its effect on the enzyme may be subtle and is not yet fully understood, cutting-edge scientific studies on this topic are underway. In one clinical trial, only hypothyroid patients carrying this polymorphism exhibited favorable outcomes on combined therapy, indicating that personalized genetic medicine may play a role in treating thyroid disease. Although more clinical and basic research studies are needed in this area, identification of this polymorphism has opened doors for those individuals who may benefit from combination therapy for treatment of hypothyroidism.